Merope, designated 23 Tauri (abbreviated 23 Tau), is a star in the constellation of Taurus and a member of the Pleiades star cluster. It is approximately 380 light years away. 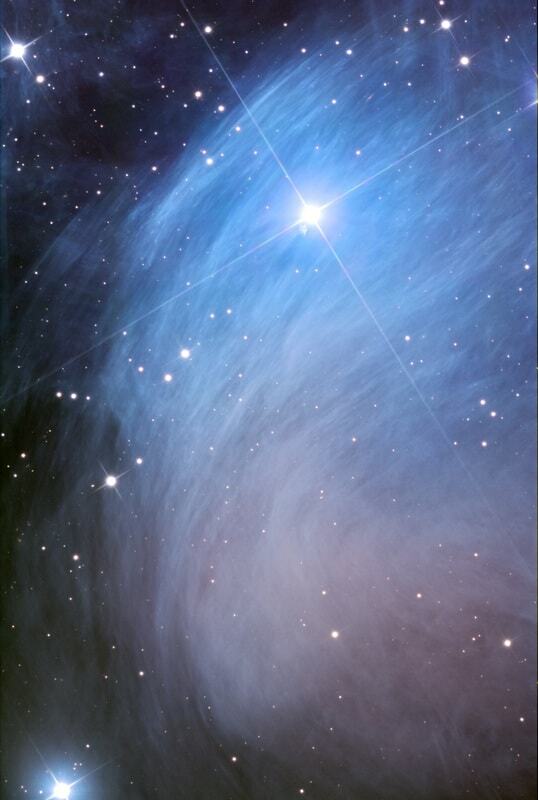 Merope is a blue-white B-type subgiant with a mean apparent magnitude of +4.14. Richard Hinckley Allendescribed the star as lucid white and violet. It has a luminosity of 630 times that of the Sun and a surface temperature of 14,000 kelvins. Merope’s mass is roughly 4.5 solar masses and has a radius more than 4 times as great as the Sun’s. It is classified as a Beta Cephei type variable star and its brightness varies by 0.01 magnitudes. Surrounding Merope is the Merope Nebula (NGC 1435). It appears brightest around Merope and is listed in the Index Catalogue as number IC 349.